Join me at MSERA 2015! Join me in Lafayette, LA this November 4-6th for the Mid-South Educational Research Associations (MSERA) 2015 annual meeting. Click this link to see the full conference schedule. For more information on the MSERA, visit their Website. The cool thing about this conference is that everybody brings their paper and not just the PowerPoint slides to handout to attendees. I ended up with tons of great research papers to read afterwards! Author teacherrogersPosted on October 19, 2015 March 28, 2018 Categories Gaming, Learner Strategies, Research, Second Language AcquisitionTags EFL, ESOL1 Comment on Join me at MSERA 2015! Thanks to Vance Stevens and Dawn Bikowski for putting together this learning event. Dawn discussed projects she’s working on for teacher training by putting digital gaming into her MA teacher training courses, including pedagogical grammar and teaching reading & writing. She also talked about her experiences as lead author of the teacher’s manual for the digital game Trace Effects, which she did for the U.S. Department of State. Dawn mentioned using Aurasma with teacher trainees in her discussion with us. On YouTube you can see many examples of what Aurasma does; e.g., http://www.youtube.com/watch?v=GBKy-hSedg8 and she explained in greater detail in her talk at the CALL-IS and IATEFL LTSIG webinar on Gaming and Gamification on Jun 14 this year, where she spent 10 minutes talking about Aurasma and how she uses it to help teachers experience games. Trace Effects is an educational 3-D multimedia interactive video game that can be played individually off-line from a DVD or online individually or with a group. There’s also a complimentary mobile app called Trace Word Soup, which is a vocabulary game. 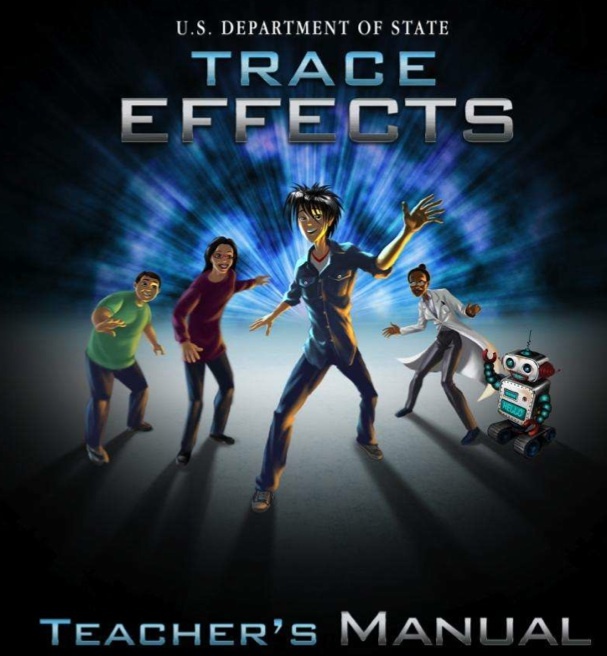 Trace Effects was designed for English language learners (ELLs) ages 12-16 by the United States Department of State (DOS), Bureau of Educational and Cultural Affairs. The game teaches American English and culture in the context of a student entering a university setting for the first time. For example, Trace, the main character, navigates the campus in search of the student information center to obtain his student identification card in order to access certain buildings and ultimately progress to the next level of play. This game (and all of its supporting material) is part of an outreach program of the Office of English Language Programs and the American English resource center, which supports the efforts of the Regional English Language Officers (RELOs) worldwide. RELOs work directly with English language specialists to promote American culture and English language learning activities in public and private schools abroad. What learning principles and practices is it based on? I was able to interview key stakeholders about the game’s program theory. Based on their comments and my review of the game and existing documents, I concluded that Trace Effects is based on the following major concepts: cognitivism, constructivism, the communicative approach to language acquisition, the Teachers of English to Speakers of Other Languages (TESOL) Technology Standards Framework, and gaming as an instructional strategy. Moreover, the DOS’s vision (pillars) factor into the game. The following DOS pillars are embedded in the levels/lessons of the game: entrepreneurship, community activism, empowering women, science and innovation, environmental conservation, and conflict resolution. The game was designed specifically for secondary school students in various nations who are involved in the English Access Micro-scholarship Program. This is one of the State Department’s outreach efforts to provide English language skills to talented 13-20 year-olds from economically disadvantaged sectors of the world through after-school classes. The purpose is to provide an opportunity for participants to improve their English skills to increase their chances of better employment and/or entrance into post-secondary schools. For example, Access participants may compete for, and participate in, future exchanges and study in the United States. How will one know if users improved their English language ability and/or learned about American culture by using the game? In the Trace Effects’ teacher manual, teachers are encouraged to assess students before and after so many hours of playtime (pretest/posttest). There are numerous extension activities in the teacher’s manual to assess learning (alternative assessments). For example, the student worksheets associated with each chapter allow teachers to monitor student learning. Students can monitor their own learning through the passive game feedback of points, redirects, and level achievement (self-regulation). Students share their progress on an electronic log with their teacher. There are competitions held worldwide for the record of the highest scorer. Stakeholders reported that educators could conduct action research to compare a control group that does not play the game with that of the treatment group that does. Another idea is using think-alouds for qualitative research—taking notes on what students report on while playing the game (phenomenology). How can I access this game for my students? Visit the US DOS website to play the game and download the manual. If you teach English abroad, contact your local RELO for access to the Trace Effects DVD and supporting material to use in your classroom. Click here to learn how to download the Trace Word Soup app. To learn about the program theory behind the game, see my logic model of Trace Effects. P. S. A special thanks to the US DOS Office of English Language Programs for the use of this image. Rogers, S. (2014). Program Theory Logic Model of Trace Effects Video Game. In Proceedings of World Conference on E-Learning in Corporate, Government, Healthcare, and Higher Education 2014 (pp. 1662-1674). Chesapeake, VA: AACE. This semester, I participated in the CreAting Machinima Empowers Live Online language Teaching and learning (CAMELOT) project funded by the European Union’s Lifelong Learning Programme. The purpose of the CAMELOT project is to provide language-teaching resources for English as foreign language instructors, as well as to share the technological and pedagogical expertise on creating and adapting their own machinima for the classroom. Machinima are screencasts of animation in virtual worlds to create movies. I interned for a grantee in the project, Heike Philp of let’s talk online, sprl. My primary goal was to learn the craft of machinima in order to assist with the production of machinima in Second Life™ (SL) utilizing Camtasia Studio video production software, as well as to produce supporting how-to guides. My personal goal was to become adept at producing media for young children. I received wonderful guidance from Heike Philp, my intern supervisor. She spent numerous hours with me inworld and in webinars hosted on Adobe Connect. We met in an SL sim she owns called EduNation. Sometimes we sat around a campfire to discuss the various issues I was having in SL. Other times, Heike or her co-moderators led training, machinima screenings, or live film shoots. They invited us to collaborate on group projects. The volunteer moderators of the workshop provided ongoing activities beyond the confines of the 5-week training. For example, in the sixth week, we were challenged to create a lesson plan to accompany our machinima for a CAMELOT competition in the SLanguages Symposium on February 28th. To create machinima, you need characters. You can ask others to star in your production or serve as extras in the background. In my case, I decided to become a character in my own simple production. Ms. Philp bestowed upon me a great gift of Linden dollars to purchase a new avatar. Now I am a grey cat that looks lifelike and makes cat sounds. I love it! I wanted to be a cat that had animated features for filming purposes. I had previously selected a tabby cat avatar from the freebies but found that it did not have the same movement capabilities of human avatars. Now with this new Zooby cat skin, I can do several actions like sit, clean myself, nap, run, purr, and meow. My dissertation will investigate the use of a noneducational, massively multiplayer online role-playing game (MMORPG), EverQuest II (EQ2), as a second language acquisition (SLA) tool for English. This study will measure the effectiveness of using MMORPGs to increase the SLA of general English as a second language (ESL) skills and vocabulary. It will replicate and extend a study by Rankin, Gold, and Gooch (2006) that only had four college-aged intermediate/advanced level English language learners (ELLs) in which they reported that participants improved their English language vocabulary by 40% from solely playing EQ2 for four hours a week for a month without instructional supports. I will use mixed methods to produce a more robust understanding of the phenomenon of gaming for SLA. The purpose of the proposed study is to determine whether college-aged ELLs can improve their ESL skills in a short amount of time from playing commercial MMORPGs as an extracurricular activity without language supports. Rankin et al. (2006) found there was sufficient support for ELLs within the EQ2 videogame; this is why I have chosen it for my study. EQ2 provides opportunities for the participants to select an avatar (character) to speak to other players’ avatars through text-based chats or in-game speech capabilities. Player characters sometimes form alliances to collaborate on a task. The non-player characters verbalize the rules and alerts to players. This and other embedded support systems (e.g., rules, signage, animation, audible alarms) provide ELLs with guidance and model language. For example, the components in EQ2 are labeled, which serves as a written English language support mechanism. This means participants will do a lot of reading and will need to understand the vocabulary in order to play the game. A special thanks to Dr. Burke Johnson for getting me started on my dissertation in his course this semester (Advanced Research Design). Note: This was updated 12/31/15, as I write my dissertation proposal for spring semester. See my PowerPoint presentation on MMORGs for Language Learning that I presented at SITE 2014 in Jacksonville, FL. Here’s a live presentation on the topic at the 7th Virtual Round Table.